Now Write! Science Fiction, Fantasy, and Horror Reviews – Now Write! Post your comment below and/or write your own review on Amazon. 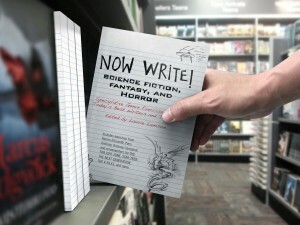 “…Whether you’re looking to write the next HUNGER GAMES or conceptualize the next installment of American Horror Story, the newest Now Write! installment will set you on the path to meeting your goal. “…Although many of the exercises found in this latest collection are quite useful and provide immediate gratification, other tips and tools are more low key, perhaps going for a deeper wax-on, wax-off Zen approach. “…Everyone has a different method of achieving their goal and it is my opinion that there is something here for everyone. If you are looking for someone to tell you how to become successful then here is the book for you. Every one of these methods is tried and true, at least for the person presenting it. Will it work for you? That depends on a variety of factors, not the least of which is your dedication the craft.